67 sublime sides from the heyday of this enduring vocal group. Includes the definitive look at their doo-wop era, For Collector's Only , featuring their finest original End and Royal Roost recordings, mastered from the original session tapes. In addition to all their hit singles- Tears on My Pillow; Shimmy Shimmy Ko-Ko-Bop; The Diary; A Prayer and a Jukebox , etc.-the 40 tracks include rarities and unreleased takes. 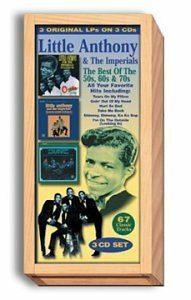 You'll also get the mid-'60s albums I'm On the Outside (Looking In) and Goin' Out of My Head , featuring their respective title track R&B hits, plus 25 more of their DCP label best.